The threats, made through email or social media, are not believed to be credible, officials said. 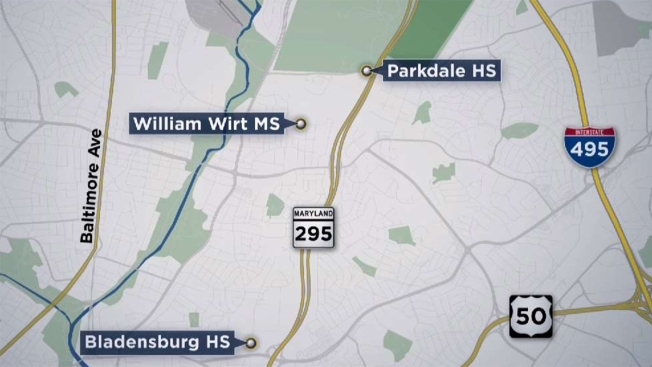 Increased security is in place Wednesday as a precaution for William Wirt Middle School, Bladensburg High School and Parkdale High School. A 14-year-old girl confessed to threats against three Maryland schools, according to Prince George's County police. The threats were not credible, police said. The threats were made through email or social media against William Wirt Middle School, Bladensburg High School and Parkdale High School. One of the emailed threats included obscene photos, police said. "We conducted a search of this juvenile’s home and we seized all of her computer equipment," Police Chief Hank Stawinski said. "Now her family is having to suffer consequences as they now have to work through the legal system with their daughter." Increased security was in place Wednesday for those schools as a precaution. "Providing students with a safe & orderly environment is our top priority & all threats are taken seriously. As a precaution, there will be additional security at all three schools when classes resume Wednesday, Jan. 2," a statement from the school district said. The suspect, whose name is being withheld because she is a juvenile, is charged with making threats of mass violence, electronic threats mailed to minor and obscene matter/possession with intent to distribute.